The short story "An Occurrence at Owl Creek Bridge" by Ambrose Bierce is well known among Americans, perhaps because the occurrence which was described here refers to the history of the USA. Ambrose Bierce wrote this story about the Civil War in the USA, the subject which was familiar to him. He was awarded 15 commendations for his braveness during the War. The story has also a controversial under-text because the main character belonged to the Confederates and the author expressed a sheer sympathy to him. The story starts with the description of the man who was going to be executed: "A man stood upon a railroad bridge in northern Alabama, looking down into the swift water twenty feet below. The man's hands were behind his back, the wrists bound with a cord. A rope closely encircled his neck. It was attached to a stout cross-timber above his head and the slack fell to the level of his knees." The man is facing the death, every detail of execution becomes visible and essential: river, bridge, shores, soldiers. He heard the ticking of his watches clearly. He thought “If I could free my hands, I might throw off the noose and spring into the stream. By diving I could evade the bullets and, swimming vigorously, reach the bank, take to the woods and get away home. My home, thank God, is as yet outside their lines; my wife and little ones are still beyond the invader's farthest advance.” Ambrose Bierce finished the first part of the story at the moment when the captain nodded to the sergeant to start execution. The following part of the story described what had happened before. It started giving a brief introduction of the main character: "Peyton Farquhar was a well-to-do planter, of an old and highly respected Alabama family. Being a slave owner and like other slave owners a politician he was naturally an original secessionist and ardently devoted to the Southern cause." Ambrose Bierce wrote that introduction without accusing of Peyton Farquhar of racism, it is a controversial line of the story. 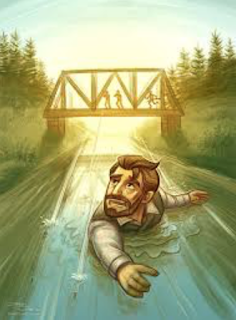 Peyton was accused for possible intention to commit the diversion on Owl Creek Bridge and as we saw in the first part of the story, he faced death on that bridge. The third, last part of the story began from the scene of a miraculous escape of Peyton. The cord broke off, he got under the water, soldiers fired but in vain, he hid in the forest, came to his lovely house, his wife met him. He thought: "Ah, how beautiful she is! He springs forward with extended arms." The last sentence of the story tells us: "Peyton Farquhar was dead; his body, with a broken neck, swung gently from side to side beneath the timbers of the Owl Creek bridge." Ambrose Bierce wrote the story in quite an original manner mixing the real and fantastic elements, the plot moved forward and back in time, he created the feeling of suspense for readers. The story is about war and it aims against it.